I recently returned to corporate world as a great opportunity showed up on my doorstep and it is only part-time and temporary. It lets me flex the skills I already have (corporate world related) to help out a good team and an interesting project and at the same time give me some side money while I get my business going as well. I have to say, that I am absolutely fascinated by how my perspective has changed. My values are different, my needs are different and my expectations are different. This side job gives me a direct view into how my life could be in Germany if I head back into the world of large corporations with large projects. Multi-nationals with multi-digit budgets have their advantages, but they certainly do not foster any creativity or self-expression. Donated these for the winners of a charity auction held at my Frankfurt language school, A-viva. A friend of mine recently told me that creative people need input as well as output. Now I never really considered myself a creative person, i.e I can’t draw to save my life! but I never realized how important creative input was until I didn’t have it. As I say in my About section, I have been debating for a long time what I want to be when I grow up…dolphin trainer, interpreter, millionaire’s wife and I was continuously on my search for another job in spite of always being employed. And now I think I have really found the secret ingredients I need to make me thrive at work. Creativity, self-expression and the immediate gratification I get when I see something come to life with my hands and have people enjoy it. 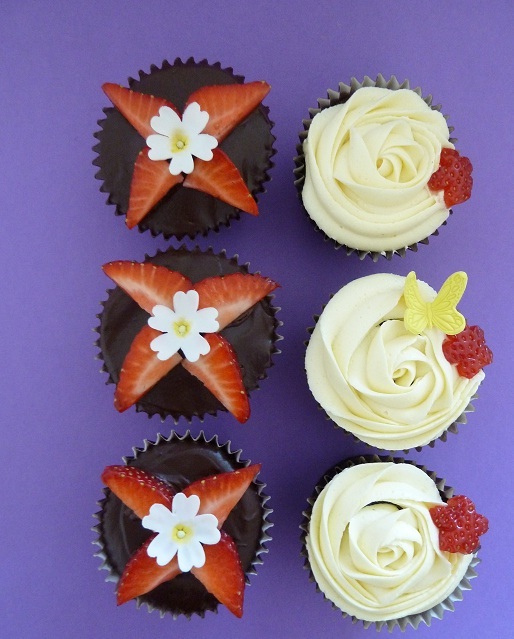 I donated 12 altogether, there were 6 chocolate cupcakes topped with chocolate ganache and strawberries and 6 chocolate cupcakes with bourbon vanilla buttercream and little strawberries cut into small flowers. My cupcake dream has been long in the making. Thanks to German laws, I have learned what it is to be a business woman and an entrepreneur. Whereas before, I had my focus dead centre on creating and experimenting with ingredients, that has recently taken a bit of a backseat (proof in the lack of pics and entries on my blog!). And although my creativity has suffered a little, it’s nothing compared to dissatisfaction I felt before. There was always something lacking in the corporate world and I couldn’t put my finger on it. Now I can really see and feel the difference. 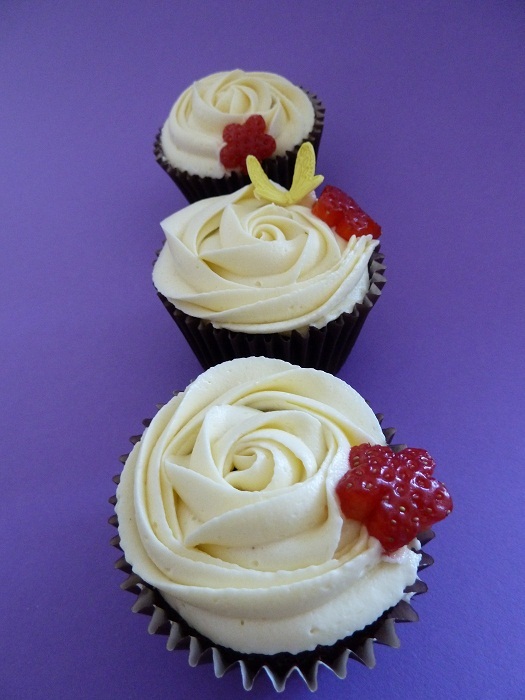 My soul gets fed and brightens up when I make and decorate cupcake creations. But when I have to rush to a 9-7 job, exerting my energy into that, I feel low and ‘blah’. It’s my goal now to really keep the balance. I see that there needs to be one kept as long as I have this side job and it’s of paramount importance that I don’t lose myself in the rush and in doing so lose the fire in my heart for baking. 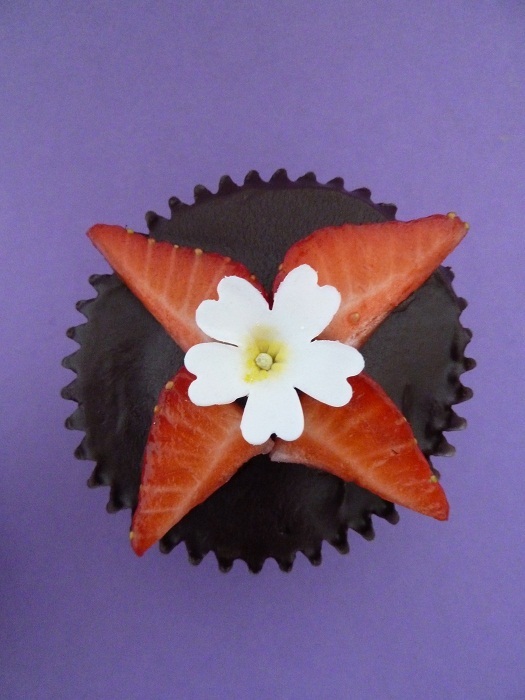 Chocolate cupcake topped with chocolate ganache and strawberries with a small fondant primrose.